Marilyn Monroe was married three times, once as a sixteen-year-old brunette in the 1940s, and twice more at the height of her stardom. You don’t hear much about her wedding outfits, and I think that’s because she never chose to wear a classic wedding dress. Actually she did wear a traditional white wedding gown for her first wedding, but at that point she was still Norma Jean Baker and had a long way to go to become the star she evolved into. 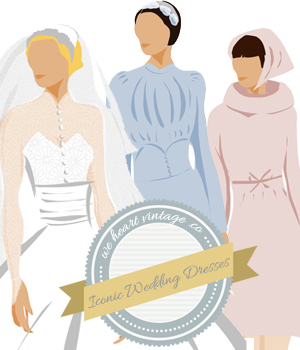 I did a lot of research into this subject and I was overwhelmed with the volume of dresses which are being sold as ‘Marilyn Monroe wedding dresses’. They range in style from the Seven Year Itch white halterneck dress to 1950s bombshell full-skirted dresses, but I haven’t seen a single one that actually looks like any of the wedding outfits she wore! Perhaps the real-life Marilyn doesn’t live up to the larger-than-life image of her people want to have, and after all her outfits were sophisticated and understated. Perhaps not the way people want to remember her. The classic Marilyn white dress from the subway scene in The Seven Year Itch. It wasn’t a wedding dress, but it’s sold as one all over the internet! Norma Jeane married James ‘Jim’ Dougherty on 19th June 1942 shortly after her 16th birthday. She and Jim had been on a few dates, including going to the movies at Grauman’s Chinese Theatre (where she would leave her own hand and footprints on the walk of fame in 1953). The two of them didn’t plan to get married, but for some reason Marilyn’s foster parents couldn’t keep her any longer so they arranged the marriage to avoid her having to go back into an orphanage. It would seem that neither Jim nor Norma Jean objected to the plan, although they never pretended it was a great love affair. She was a pretty, athletic 16 year old and he was a good-looking, popular boy 5 years her senior. He joined the army the year after, and she started modelling. I can’t find out many details about her wedding dress. Some sources say that the dress was borrowed, and some say that Marilyn’s Aunt Anna Lower made the dress. I guess it could have been both of those things. From what I’ve seen, the dress was a typical 1940s shape with slightly padded shoulders and narrow waist. It was full-length, covered in lace (which I can’t draw, sorry!) with ruffles around the neckline and shoulders, long sleeves which went to a V point along the hands. She wore it with a 40s style headpiece and a medium length veil. James and Marilyn were divorced on September 13, 1946. Marilyn married baseball superstar Joe DiMaggio on Jan 14th 1954 at San Francisco City Hall. She wore a chocolate brown broadcloth (wool) pencil dress with matching jacket trimmed with a white Ermine fur peter pan collar. The jacket had a bow at the neck, white buttons and she wore it with a brooch at her throat. She forgot her coat in the media frenzy that awaited them and never went back for it. I wonder what happened to it…? Despite there being a scrum of photographers waiting for them outside the registry office, I’ve only been able to find photos of her with the jacket on, so I don’t know much about the top half of the dress, just that she wore the suit with open toe heels and white gloves. The Monroe/DiMaggio wedding was tempestuous and troubled from the start. The marriage only lasted 8 months because of problems caused by Joe’s jealous nature and the pressures of fame (Marilyn suggested that Joe couldn’t handle her being more famous than him). Despite this, it seems like Joe was a constant and reassuring presence throughout Marilyn’s turbulent life, and there were even rumours that they were planning to re-marry shortly before her death. ‘I’ll finally get to see Marilyn’. There was a total media frenzy surrounding the relationship between Marilyn and Miller, so much so that they rushed to get married in secret, and this is what Marilyn wore to the private civil ceremony (below). It was reported in the papers that she had worn ‘sweater, skirt and no hat’, by which they seemed to mean this beige blouse (worn with the sleeves rolled up for photographers afterwards, but rolled down and fastened with gold cufflinks for the ceremony) worn with gloves and a brown pencil skirt and dark brown leather belt. A few days later, they had a Jewish wedding ceremony with Miller’s family and some friends. She wore a light beige gown designed by Norman Norell and costume designer John Moore. It was a light beige muslin gown with peasant neckline and satin belt. She couldn’t find a veil to match the dress so dyed it in coffee. You can see the dress in the home video below, and it looks more of a light dusty pink to me, so that’s the colour I drew it! Follow We Heart Vintage’s board Marilyn Monroe’s weddings on Pinterest. Image source and copyright: 1, 2, This work is in the public domain because it was published in the United States between 1923 and 1977 and without a copyright notice. Such a shame Marilyn died or was she murdered only God knows.